The top two teams in the Eastern Conference go at it when the Bruins square off against the Capitals (7 p.m. ET, Versus, TSN) in one of 11 games Tuesday night as the NHL returns from its All-Star break. Five other early games feature the Rangers hosting the Hurricanes; the Blue Jackets looking to avoid losing their fourth of five games against the Red Wings; the Devils going for their sixth-straight win against the Senators; the battered Canadiens facing the Lightning, and the Flyers visiting the Panthers. Later, the Maple Leafs make their lone trip to Minnesota; the Stars host the Thrashers; the Sharks try for their sixth win in seven games when they play the Avalanche; the Oilers continue their six-game homestand, and the Ducks travel to Phoenix in a Pacific Division showdown. * Boston center Marc Savard, who had three assists in Sunday's All-Star Game, has three goals and four assists in his last seven games with the Bruins. Savard, who has been in the top five in the League in assists the last three seasons, saw his first playoff action in his 11-season career last spring when the Bruins fell to the Canadiens in seven games in the first round. Live Games. Online. Right Now. Streaming TV-quality video of all live game b'casts. Inside-the-glass camera angles for select games. 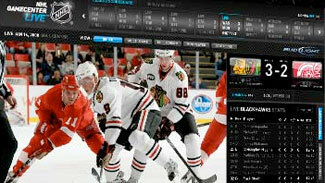 Multi-game view for up to four games at once. Complete access to the REPLAY game archive. * Blackout and other restrictions apply. * Hurricanes center Tuomo Ruutu, drafted No. 9 in the 2001 Entry Draft, leads the team with 119 hits. Ruutu, who hasn't scored 20 goals since his rookie season of 2002-03, has 13 goals in 45 games and is on pace to finish the season with 22 goals. * Columbus center Jason Williams, who was traded from the Thrashers on Jan. 14 for Clay Wilson and a sixth-round draft pick, has two goals and four points in four games with the Blue Jackets. Williams, who signed with Atlanta as a free agent last summer, played a season-high 23:06 last Wednesday in Columbus' 5-4 shootout loss to the Flames. * Devils right wing Dainius Zubrus, who plays on a line with Brian Gionta and Patrik Elias, had two goals Jan. 4 in New Jersey's 4-3 overtime win in their last game against the Senators. Zubrus, who had 13 goals and 38 points in 82 games last season, has 11 goals and 28 points and is on pace to finish this season with 19 goals and 48 points. * Montreal, which had the best power play in the League last season at 24.1 percent, has the worst power play in the Northeast Division this season at 16.1 percent. The Habs, who are in fourth place in the Eastern Conference with 60 points, have allowed more goals in the third period (45) than in either of the other two periods. * Panthers goalie Craig Anderson, who is second in the League with a .930 save percentage, has played in just one game since Jan. 4. Anderson, who has already played a career-high of 22 games this season, is facing an average of 29 shots per game. * Wild center Mikko Koivu, who has 14 more points than any other Minnesota player with 46, has seven assists and nine points in his last six games. Koivu, who is one assist shy of his career-high of 34 assists, scored 7 of his 13 goals in November and has just two in 10 January games. * Dallas defenseman Stephane Robidas, who played Sunday in his first All-Star Game for the Western Conference, leads the team with 125 hits, 75 blocked shots and a plus-10 rating. Robidas, who has played 20 minutes in 40 of 42 games this season, has a plus-7 rating on the road. * The Sharks, who have five of their six regulation losses on the road, have an 11-3-3 record when the opponent scores first. San Jose, which is the least penalized team in the Pacific Division with an average of 12.8 penalty minutes per game, has the second-fewest blocked shots on the road in the League with 210. * Edmonton right wing Ales Hemsky, who has two goals and four points in three career games against the Sabres, has four assists and six points in two games since returning from missing 10 games with a concussion. Hemsky, who is tied for third in the League and leads the Northwest Division with 18 power-play assists, has 17 of his 27 assists on the road. * Phoenix, which is in second place in the Pacific Division with 53 points, has a 9-2 record in two-goal games. The Coyotes, who have scored just 35 first-period goals, have scored 45 goals in each of the other two periods. Contact Adam Schwartz at aschwartz@nhl.com.